We all know the power of Instagram. Huge companies like Coca Cola, Starbucks and Nike dominate the space. Companies with established followings seems to have no problems getting engagement and results. But how can you use Instagram for small business? You don’t have to be an enterprise-sized company to get value from Instagram. In fact, the mobile app allows small businesses to compete with the “big guys.” If you’re not using Instagram for small business yet, you’re missing out on a potential gold mine of opportunities. Looking for more small business resources? Out of all of the newer social networks, Instagram does a lot to set itself apart. With over 500 million monthly active users, Instagram is the fourth-most downloaded app in the US. Since Instagram marketing is still fairly new, some small businesses struggle to gain traction. 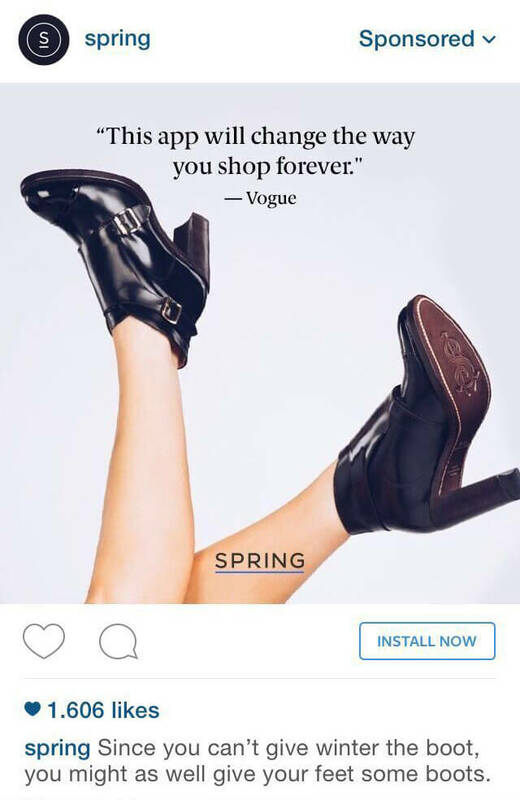 You don’t have clickable links in your posts, it’s a mobile-first app, which relies a lot more on visuals than text. As a result, we’re seeing a lot of small businesses sign up, get confused about how to actually use it and then give up. However, with social media management tools like Sprout that integrate with Instagram, it’s a lot easier to get started, no matter what size your business is. So how do you cross over from being just another company on the app to achieving the level of success companies like Bon Puf, Simple Green Smoothies? It’s a good idea to connect your company’s social accounts. This is particularly true if you already have social media profiles with a strong following. 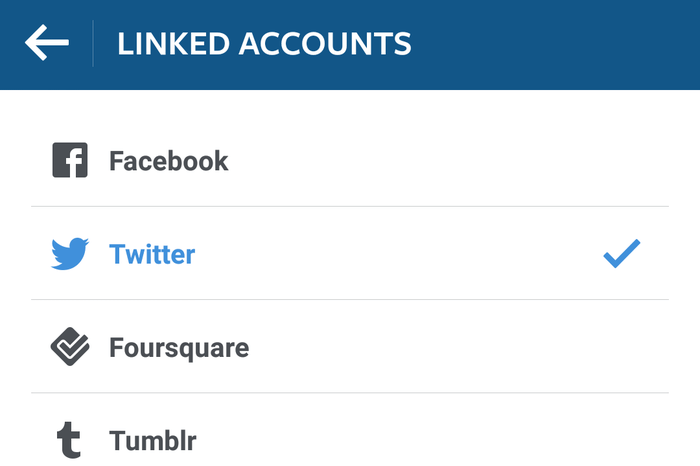 You can push your followers on Facebook, Twitter, Tumblr and other sites to your new Instagram account. Instagram lets you connect your other profiles so that your new posts can get published to those accounts automatically. Don’t forget to add your website and write a bio for your profile that explains what your company is all about without being boring. Fallen Industry’s profile does a great job of letting users know what they do while making it intriguing at the same time. Another good way to use your bio is to add in additional contact information. By default you can only have one clickable URL in your profile. But what you can do to get around that is include URLs in your bio. Pro tip: Shorten any URLs you use in your bio using a service like Bitly. It’ll take up less characters and make it easier to track your traffic from Instagram. Check out our post on how to write Instagram bios for businesses to learn more about crafting your Instagram bio and putting your best foot forward. Instagram Stories have been a controversial feature to say the least. In case you haven’t heard, Instagram Stories lets you string together multiple pictures and videos into a “story” that disappears after 24 hours, similar to Snapchat stories. Small businesses have been slow to use Instagram Stories while they try to figure out how to best weave the feature into their own strategies. But there’s a lot of potential you shouldn’t pass up. Like with any big change, the companies that adopt and figure it out first tend to reap the biggest benefits. Follow in the footsteps of brands like Taco Bell that have gone all-in on Instagram Stories. Start experimenting and get creative to see what you can come up with. 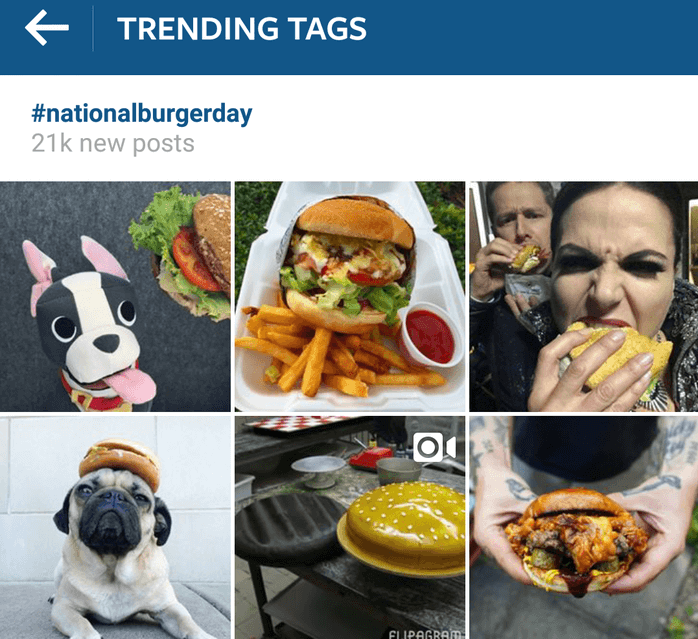 Are you paying attention to which Instagram posts get the most engagement? Do you know which hashtags perform the best? 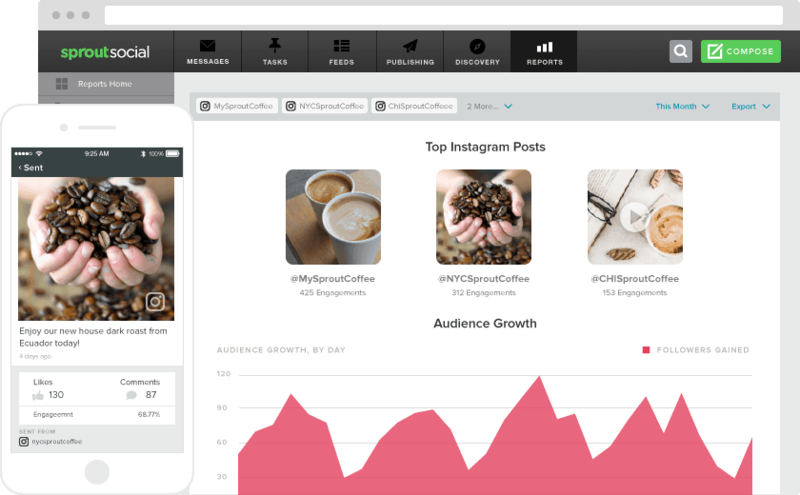 Using Instagram reporting tools can help you see all of this information from a single dashboard and track it over time. By looking through data, you’ll get an idea of what type of content resonates with your audience the best. Whether it’s a certain style of photo, a particular filter or a popular hashtag. The more info you have about the content your audience resonates with, the more you can improve your future posts. Do you publish Instagram posts and never look at them again? You’re not alone. A lot of small businesses spend little to no time monitoring their comments, partially because it’s not the easiest thing to do within the Instagram app. It’s also difficult because most brands look for publishing and not Instagram engagement. 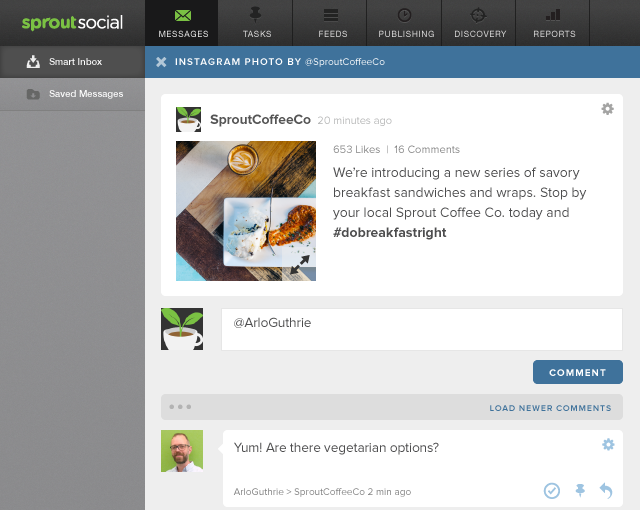 In order to make responding to Instagram comments easier, use Sprout Social to reply to comments across multiple Instagram accounts and all your other social media profiles. Influencer marketing is one of the best ways to quickly build up your Instagram following, particularly when you’re starting from scratch. Through influencer marketing, you can connect with people with an established following and get exposed to their audience. In the past (pre-social media) influencer marketing required huge budgets to get athletes and actors to endorse your products. But social media has changed the game. Now non-celebs can be influencers and have hundreds of thousands or even millions of engaged followers. Not only has this made it easier for brands to connect with influencers, but it also made influencer marketing a lot more affordable. You may not be able to afford to have a Hollywood A-lister post about your products on Instagram. But you can probably link up with a popular Instagram influencer with a nice-sized following. Start by making a list of the top influencers in your industry. Look for them on Instagram to make sure they have an engaged audience. It’s not just about how many followers they have, it’s about how much engagement they get. Check out how many Likes and comments they get on their posts and how often they post. Then reach out and let them know you’re interested in working together. It’s best to have some ideas for what you’d like to do before approaching them. Two common options are contests and sponsored posts. Also, the influencer might have some ideas on how you can work together as well. Instagram’s search feature looks for hashtags instead of keywords. On platforms like Twitter or Facebook, you can do a search for “hamburgers” and see all the Tweets and Facebook posts containing that keyword. But with Instagram, you have to search #hamburgers. If you want your posts to show up in the app’s search, you need to start using hashtags for Instagram. It’s a quick way to increase your visibility and reach people who aren’t already aware of your brand. The trick is to use the right hashtags. A common mistake some businesses make is using random hashtags they made up. Unfortunately, nobody is searching for those random hashtags so they’re not helping you grow your following. The real value comes from finding ways to post pictures related to popular or trending hashtags. When you do this, your images have a chance to show up in the Trending Tags section of Instagram. What’s trending at the moment might not always be relevant to your business or the images you post though. In those cases, you can use Websta to see a huge list of popular hashtags that might not be trending, but are still being used heavily. Websta will show you more generic and broad hashtags that are easier to fit into your non-themed Instagram posts. Something unique to Instagram that you don’t see on many other social networks is using a lot of hashtags can actually get your images more likes. On Twitter, having 10 hashtags in a Tweet would be crazy. But on Instagram it’s pretty much the norm. 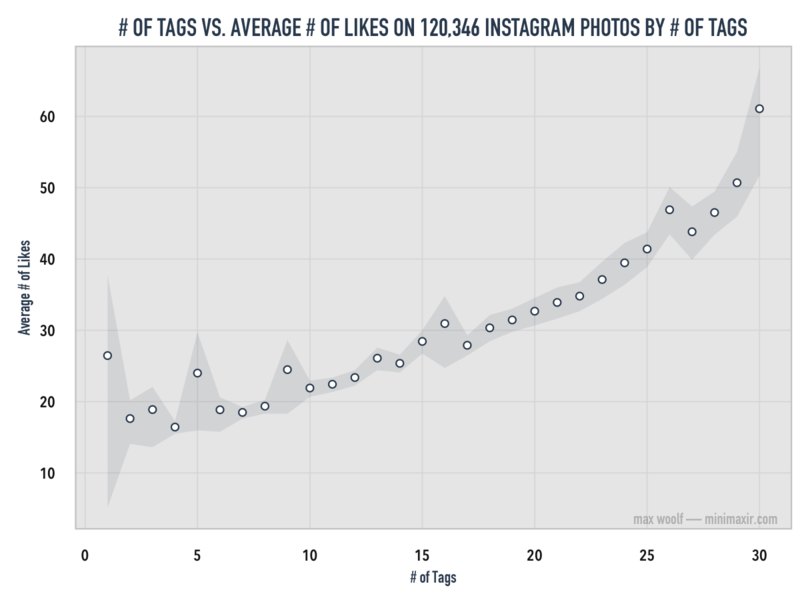 In a case study from Max Woolf, over 120,000 Instagram photos were analyzed and he found that photos with the maximum allowable hashtags (30) received three times the amount of likes as photos with just a few hashtags. This doesn’t mean every Instagram post needs 30 hashtags. Using hashtags just for the sake of having them isn’t recommended. But the point is photos with hashtags will get a lot more attention than those that don’t. 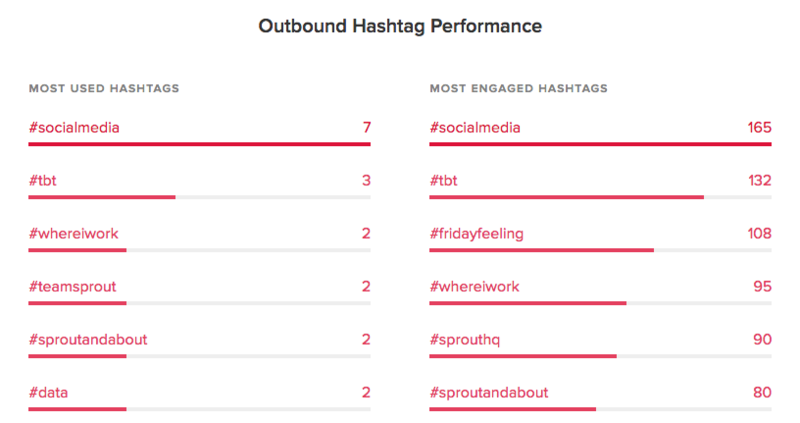 Once you start using hashtags in your post, you can use Sprout to see which of your hashtags are performing the best through our hashtag performance report. I’m sure we don’t have to tell you about how important video has become for small businesses. Even though photos currently generate more engagement, video is on the rise. Instead of waiting for other brands to dominate while you play catchup, get started right now. With Instagram Stories and live videos, the app is making a clear push toward video content. The great thing about using Instagram videos is they don’t require a ton of production. All you really need is your phone and some creativity. Plus the videos are served in bite-size pieces with a time limit of one minute. Follow in the footsteps of small businesses like Wahl, which generated a 4,307% spike in engagement within a year by focusing on more engagement and building a better Instagram strategy. Sharing other people’s content is one of the best ways to start building connections. When you’re just getting started with using Instagram for small business, building up your initial audience should be your top priority. You need to start getting eyes on your profile to get some initial shares and engagement. Regramming is a quick and easy way to start getting some momentum. Unlike other networks, Instagram doesn’t have a native way to share other people’s content. You can either Like or comment. But there are third party apps that give you the ability to regram. Check out our guide on how to regram for more info and some different apps you can use. One of the biggest obstacles that stops small businesses from trying social media advertising is costs. When you don’t have a big budget, it’s a little more difficult to justify spending money on advertising. But Instagram Ads present a great opportunity for small businesses because it’s extremely affordable. Getting started is simple, particularly if you already have a Facebook Advertising account because it’s built into the same platform. However, we recommend creating custom image assets specifically for Instagram Ads instead of reusing the same ones you would for Facebook because of how it’s displayed in the feed. There’s no denying the fact that people absolutely love free stuff. Instagram contests give your company an interesting way to engage with current and potential fans. Make a theme for your contest instead of the generic “follow us to win a free product” approach. Create a custom hashtag for your contest. Make people tag a friend and comment to enter the contest. This will help your contest spread a lot quicker. Start promoting the contest at least a week before it starts to build anticipation. Consider collaborating with other companies or influencers to get even more reach. Before you start, read through Instagram’s promotion guidelines to make sure you’re doing everything above board. Since the goal is to get loyal followers, whatever you’re giving away should be somewhat related to your industry. That way you’re not just attracting freebie seekers, but people that are legitimately interested in your brand. One of the quickest ways to get a surge of new followers is to get a shout out or mention from someone that already has a large following. The great thing about Instagram is that a lot of popular accounts aren’t owned by huge corporations. They’re owned by regular people and lifestyle entrepreneurs who have done a lot of the leg work to build their own audience already. When these people give a brand a shout out, their followers instantly go to check out the account and will more than likely give you a follow. This is one of the techniques Neil Patel used in his infamous $57,000 Instagram case study. Obviously the second method is ideal, but let’s start out with the first option. A lot of small businesses aren’t aware that paying for sponsored Instagram posts is even an option, but it’s a very popular way to start get the ball rolling on your account. The male accessory brand Bachelr used sponsored Instagram posts to promote its website when it first launched, and saw great results. 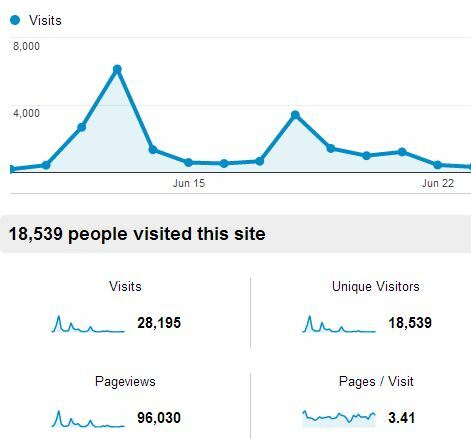 The brand generated over 20,000 new visitors in just two weeks. Bachelr credits a huge chunk of the success to influencer marketing. One of our most successful posts was a model holding one of our products in a natural setting, no logo anywhere. This got 10k likes and 100+ comments. Make a list of the top influencers related to your industry on Instagram. Focus on individuals rather than businesses. Most users who accept sponsored posts will have their contact information in their profile so it’s easy to reach them. When you’re looking for influencers, choose people who are a good match for your brand. Otherwise the new followers you’ll gain won’t be very likely to engage with your content. The second technique is simply good old fashion networking. Start following companies who are complementary to your brand and engage with their content. Leave comments, like their photos and even reach out to them via email. As these relationships start to grow, look for opportunities to promote each other on Instagram. Maybe you can team up on a joint venture or host an event together. Post photos on your Instagram pages and tag each other in them. There are plenty of possibilities. One company putting an interesting twist on both of these techniques is Gym Shark. The active wear company caters to athletes, bodybuilders and people who live all-around active lives. One of Gym Shark’s techniques for growing its following is sponsoring influencers in the fitness niche. Its sponsored athletes post pictures on their own Instagram pages wearing Gym Shark’s products, and Gym Shark posts images of them on its page as well. With this strategy, the first part is already taken care of. If a user is following one of your competitors, they’re more than likely already interested in your industry. That makes it easier to win them over and get them to follow you too. From that point, it’s all about keeping them engaged through the content you post. You’ve already followed them, so now you just have to like some of their photos, comment or both. This will increase the likelihood of people following you back, and also reciprocating your engagement. The more you engage with your audience, the bigger your return will be. Growing a dedicated following on Instagram won’t happen overnight. But the bright side is that Instagram users are very active and love to engage. So once you get the ball rolling, you’ll notice that your brand will start to build organically. Start putting these techniques into action and you’ll see how powerful Instagram can be for your business. 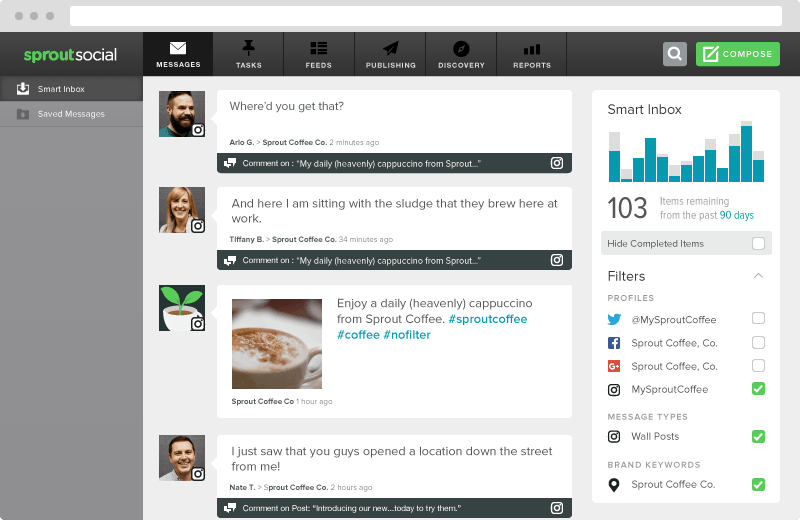 Social Tools for Scheduling, Engagement, Reporting and More! Sprout Social's platform helps thousands of small businesses increase their social following, engagement and business revenue. Fill out the form below and one of our SMB experts will be in touch soon!